Ethel Harkins was born on 29 September 1907 in Bedias, Grimes County, Texas. Joseph Walter Harkins and Martha Ann Lewis appeared in the US federal census of 15 April 1910 in Grimes County, Texas. Other members of the household included Ethel Harkins. Joseph Walter Harkins and Martha Ann Lewis appeared in the US federal census of 1 January 1920 in Bedias, Grimes County, Texas, at Anderson Road. Other members of the household included Ethel Harkins, Winnie W. Harkins and Chester Marshall Harkins. Ethel Harkins appeared in the US federal census of 1 April 1930 in Houston, Harris County, Texas, at 3920 Fannin. 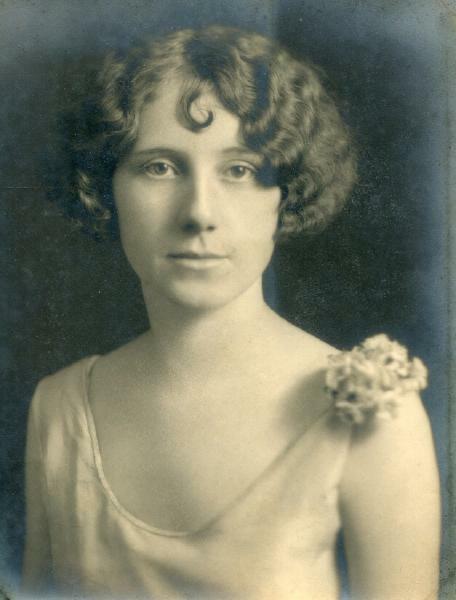 She married Henry Campbell Wood, son of Rush Brevard Wood and Claudia Gertrude Bay, on 1 February 1933. She was employed as a secretary in an insurance office, according to the 1930 census. She officially witnessed the death of Martha Ann Lewis on 31 July 1967 at 613 Hill Street in Navasota, Grimes County, Texas; at her residence. Robin was a granddaughter of Ethel Harkins and Henry Campbell Wood. Ethel Harkins died on 29 December 2001 at age 94 in Sarasota, Sarasota County, Florida. The following appeared on 18 January 2002 in the Houston Chronicle: Ethel Harkins Wood, age 94 of Sarasota, Florida, formerly of Houston, passed away Dec. 29, 2001 in Sarasota. Her grandchild, Robin Wood, preceded her in death. She is survived by two sons; H. Campbell Wood and his wife Sondra of Sarasota and Dale Walter Wood of Tulsa, OK. Grandchildren Stacy Wood and her husband Michael Broh of Spring Green, WI. and Lara Wood of Albuquerque, MN. Great Grandchildren Jonah. Rebecca & Joshua Broh of WI. There will be a Memorial Mass, Saturday, January 19th at 10:30 AM at Corpus Christi Catholic Church in Houston. Memorial contributions may be made to the Duchesne Academy of the Sacred Heart, 10202 Memorial Drive, Houston, TX. 77024 in memory of Robin Campbell Wood. She was interred at Memorial Oaks Cemetery, Houston, Harris County, Texas.